Taneyev’s Fifth and Seventh Quartets make an excellent coupling. Their similarities outweigh their differences, and both come close to perfecting the Classical elegance that so much of the composer’s chamber music seeks. The influences of Bach and Mozart are apparent throughout Taneyev’s work, but in these two quartets, the latter clearly predominates. We hear counterpoint in all the Baroque formulations that Taneyev so loved, but there is never any sense of density or weight to the textures. Instead the music is all lightness and grace, and while the string writing is always innovative it is also outward looking and always seeking, and for the most part succeeding, to appeal even to the most casual listener. The numbering is misleading here. The Seventh is in fact the earlier of the two quartets, written in 1880 when the young composer was living in Paris. The Carpe Diem Quartet gives a direct and unmannered account of the music, bringing out an almost pastoral sensibility to the thematic expositions. This being Taneyev, a contrapuntal complexity soon intervenes when the themes come to be developed, but even then these players are able to keep the textures open and the rhythms light. The Fifth Quartet was written in 1903, at the start of the central period of Taneyev’s creative life when he wrote exclusively for string ensembles (this from Anastasia Belina-Johnson’s informative liner notes). It is a shorter work and feels more concise at every level of its structure. Perhaps Taneyev comes even closer here to the model of Mozart in the structure and scale of the music, although his propensity for flowing, lyrical lines makes the Seventh Quartet’s larger scale a better fit for its constituent music. The Fifth is another great piece though, and one that repays multiple auditions. Don’t be fooled by the apparent directness of this music on first listening: each time you hear it something new is revealed. 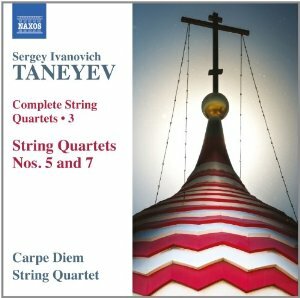 Throughout this cycle (this is volume three of a Complete String Quartets set) the Carpe Diem players have been up against a single but formidable rival: the Taneyev Quartet recordings, made in the 1970s and rereleased on CD about ten years ago. In previous instalments, I have felt that the Taneyev players have retained the upper hand. Their readings are more involving, more Romantic and more expressive. And the sound quality is very good for the recordings’ age. This volume of the Carpe Diem cycle replicates volume two in the Taneyev Quartet cycle. The Carpe Diem interpretations are lighter and more agile, with less rubato. They are also miked more closely, giving greater clarity if less atmosphere. In previous issues all of these factors have been mixed blessings, but the Classical grace of these two works lends itself better to their approach than do the other works in the cycle. The first movement of the Seventh Quartet seems to benefit particularly, especially as the Taneyev Quartet add more rubato than the phrasing needs and take a pedantically emphatic approach to the thematic statements. On the other hand, the more involved sound of the Taneyev Quartet continues to appeal, as does the greater stereo separation in their recording. I’m going to call this one a draw, while emphasising that anybody with an interest in Taneyev’s chamber music owes it to themselves to hear both versions.